Shadow Election is an application to help voters get a better understanding of who the candidates are and what they represent. Users rate the opinions of candidates on topical issues, and the system uses these to make candidate voting recommendations. It also allows people to cast a virtual vote – resulting in a "live" election poll. Users can then help support their preferred candidate with Facebook promotional options. 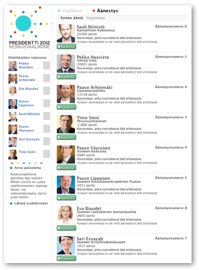 The first version was used with considerable success in the Finnish Parliamentary 2011 and the Presidential 2012 elections. of voting in the Finnish 2012 Presidential elections. A 2nd version, being developed for the US and Kenyan Presidential elections, will include data visualization features that will compare your opinions with friends and other users. And also allow analysis of which candidates are winning in electoral regions, with the ability to see specific opinions that are popular. In all countries, but particularly in young democracies like Kenya, if Shadow Election gains good traction, it should help level the playing field between the well-funded established politicians and upcoming grassroots candidates. We are actively looking for sponsors to help bring this service to Kenya.